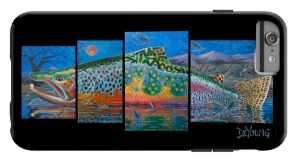 High-quality, unique and functional phone cases that perfectly reflect Derek DeYoung's colorful, innovative artwork. Printed in the USA. The Tough Case comes with a shock resistant rubber inside insert and front screen bumper surrounded by an unbreakable plastic shell. LifeProof Cases are the thinnest, lightest, strongest all-protective case ever created. It delivers the waterproof, dirt-proof and shockproof protection and features a scratch protector that completely safeguards your touchscreen. Every feature works seamlessly with your iPhone — camera, buttons, microphones and speakers. On these cases, we have collaborated with "Skin It" to provide their patented scratch resistant "skin". Cases come with the "Skin It" applied.